Primitive, Apichatpong's seven-channel video installation that's the umbrella for his feature Uncle Boonmee Who Can Recall His Past Lives, is getting more exposure. It's going on right now in Mexico City at the Universidad Nacional Autónoma de México (UNAM) until June 5. The exhibition is part of Ficunam film fest, which ran from February 24 to March 3, and mounted a massive retrospective on Apichatpong, showing his shorts and features. Apichatpong himself has been in Mexico City, overseeing the installation of the exhibition. He took time out from that work to do a Q&A chat with Dustin Chang, which ran over at Twitch. He talks about Uncle Boonmee and his upcoming Mekong Motel, which he describes as a short film of about 60 to 70 minutes that will be part of a larger art project about the river and how dams on are affecting the livelihoods of people in the region. He also mentions the Chris Ware poster for Boonmee's U.S. release, and says he asked distributor Strand Releasing for a graphic-arts poster/DVD cover and Ware was the "first artist who popped into my head." Primitive next comes to New York's New Museum, where it'll run from May 19 to July 3. Uncle Boonmee Who Can Recall His Past Lives, meanwhile, is opening in New York and in Japan. The U.S. trailer, here earlier, is at Apple. David Edelstein reviews Uncle Boonmee for New York Magazine, advising viewers to "adjust your biorhythms accordingly." 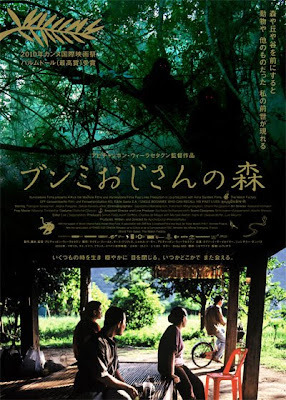 The Japan Times has a review of Boonmee Ojisan no Mori (ブンミおじさんの森). Time Out New York has an interview. Apichatpong talks about his "free take" style of filmmaking, "where I tell the actors and the cinematographer, 'Do whatever you want, go for it.' I usually end up using those accidental takes a lot; a number of those are in Uncle Boonmee as well." Village Voice has an interview too, which mentions Apichatpong's early influences "beyond Spielberg and other recommended imports like Bonnie and Clyde, beyond hip B-horror movies like Evil Dead, beyond Thai films, he searched through bins in Bangkok for videos, most of them now long forgotten, that spoke to his developing sensibility. 'Give me something different.'" Awards Daily includes Apichatpong among "50 they forgot" as an answer to Entertainment Weekly's "25 greatest working directors". There's one of many academic views: Apichatpong Weerasethakul: Case Study of an International Asian Filmmaker. "In a very different key, marching to the beat of its own peculiar drum, is Uncle Boonmee Who Can Recall His Past Lives from Thailand, last year’s surprising and somewhat controversial Palme d'Or winner at Cannes last year. Its director, Apichatpong Weerasethakul, is unlikely to hear his name mentioned at any future Oscar broadcast, and not only because it will be hard to find a presenter to pronounce it correctly. His films are oblique and lyrical, unfolding in a world composed equally of animism, modernism and Mr. Weerasethakul’s idiosyncratic aesthetic sense. I’m not sure that either of these is the best film of the year, but it gives me pleasure to imagine an alternative universe in which the Academy would recognize their virtues, and put them in the same bracket as the usual Hollywood and indie products." In Thailand, Uncle Boonmee has won recognition from the Starpics Awards and the Bangkok Critics Assembly, but is oddly shut out of the top honors in the main industry kudos, the Suphannahongsa Awards. Oh, in case you missed it, there's a trailer for Quattro Hong Kong 2, a Pan-Asian shorts compilation which includes Apichaptpong's M Hotel. It premieres as on of the openers of the Hong Kong International Film Festival on March 20. Boonmee, Malady and Thai Film Week in D.C.